The CATRI concept was conceived and developed by a group of talented scientists who were also multihull enthusiasts, keen to advance the 'state of the art'. The aim was to design, engineer and build a folding trimaran which is exceptionally fast (relative to multihulls of similar size), stable, strong , durable, and easy to handle, all at a competitive price. Aldis Eglajs was able to tackle this exciting task as he had developed high levels of technological and theoretical expertise over his thirty years of experience in the USSR multihull industry based in Latvia. During these years a program of extensive experimentation and development (both theoretical, and in relation to advanced construction techniques) has resulted in the CATRI concept. Central to this concept is a patented hydrofoil system which provides new levels of speed (on all points of sail), stability and sail-carrying ability. The float mounted hydrofoils also allow elimination of the traditional main hull centreboard/case, giving considerably more interior room and flexibility with design of the interior. 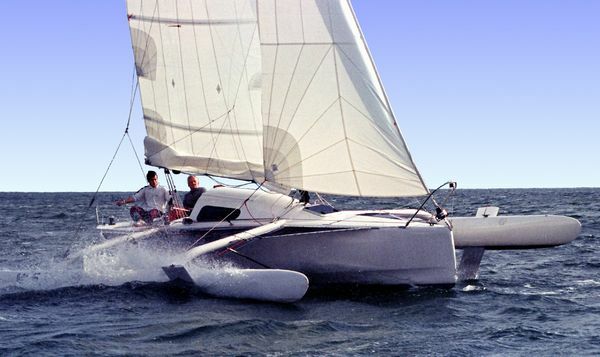 The Catri is designed for people who are interested in experiencing a new level of dynamic sailing both in competitions and in weekend cruises with family and friends. This trimaran will be especially attractive for young people, looking for affordable dynamic boats with high cruising speeds. Simple controls, high stability and safety will be an advantage for senior yachtsmen as well. The trimaran is adapted both for inland and coastal sailing, but it is comfortable enough for a longer cruises during vacations. The compactness and lightness of Catri trimarans make them easily controllable on the water and transportable on a trailer.